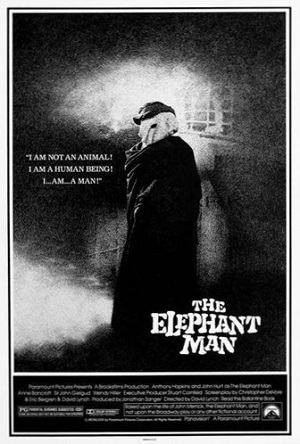 The Elephant Man is a 1980 movie by David Lynch. This was his second movie (the first being Eraserhead) and his first commercial one. The film is in black-and-white and tells the story of a real-life 19th century man named Joseph Merrick. The Victorian doctor Frederick Treves (Anthony Hopkins) hears about a severely deformed young man named John Merrick (John Hurt) working at a freak show. This man is called the Elephant Man since some people believe that his appearance is due to his pregnant mother being knocked over by an elephant. Treves pays the show's owner Bytes (Freddie Jones) so that he can examine and use Merrick at a medical presentation. The deformed man is so odd-looking that he has to wear a hood and those who see him flee in terror. After learning that Bytes is abusive towards Merrick, Treves hides Merrick in one of the hospital's isolated rooms. Things become more complicated when he finds out that Merrick is aware and quite intelligent. The Elephant Man is a touching film that will make you rethink how you look at people you consider weird or ugly. It is heartening to see Merrick transform from a scared, mute creature into an eloquent, talented young gentleman. Even with the cruelty and abuse he suffered throughout his life, he still turns out to be thankful and kind. You can't help but root for him and wonder how much more he could have been if he were normal. The growth of the other characters in the movie is also interesting. Some characters see Merrick as a hideous monster or a burden to the hospital's resources at first, but later on you see them becoming Merrick's friends and staunch protectors even. There are some rich people who meet Merrick just to be "in", but there are also rich and very influential people who are genuinely nice to and cared for Merrick. They are the ones who are able to secure Merrick's needs and help change how other people see him. Other freak show workers are also able to rise above their fear of Bytes and have the compassion to help Merrick. Seeing Merrick win over these allies without trying makes you feel hopeful of humanity. The notion of exploitation is also touched upon. While Bytes is obviously a villain, another "bad" character does not see himself as such, since even though he profits from Merrick, he and his companions do not physically hurt him. An argument between Bytes and Treves makes Treves wonder if even he is unwittingly exploiting Merrick. Merrick enjoys socializing with his guests, oblivious to the fact that some of those guests still see him as an oddity and only pay superficial kindness to him. All that attention elevates Treves' career -- does that make Treves an exploitative man even though his actions bring Merrick happiness? Unlike Lynch's Eraserhead and his later films, The Elephant Man is a straightforward story -- no "mindfuckery" or need for deep analysis of symbolisms involved. There are some surrealist bits at the film's start and end which the studio executives wanted to remove back then. I agree with the execs on this one, but those bits are just short. The actors involved in the movie were all good in their portrayal. Even now, more than 30 years after this film was made, I still find it unbelievable that John Hurt's makeup took 7-8 hours to apply and 2 hours to remove. We may look at the makeup as commonplace nowadays, but during that time, it was revolutionary in the movie industry -- so much so that when makeup artist Christopher Tucker did not receive an Academy Award for it, an outrage resulted and the Academy Award introduced the Best Makeup and Hairstyling category the following year. Some critics (including the late Roger Ebert) find The Elephant Man to be too sentimental. I agree. The film is very touching, yet upon checking out the main character's real-life story after I saw the film, I felt a bit cheated. The film is a romanticized version of his story. 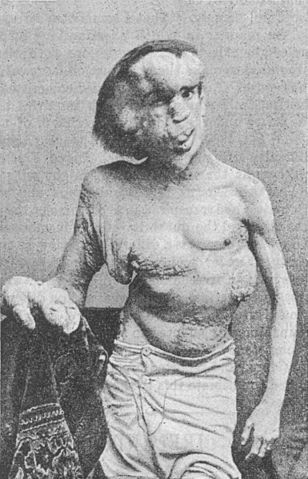 The real-life Elephant Man named Joseph Merrick was able to go to school and work for a few years. He was not kidnapped or abused by the freak show owner; instead, he was the one who contacted the showman so that he could work as an attraction. His work as a human oddity earned him some money which he hoped would someday enable him to buy his own house. Due to his deformities, his speech was barely intelligible (except for Dr. Treves who later learned to understand him) so the scenes of him articulately conversing with his guests are not realistic. The movie version of Joseph Merrick is too "perfect", too pitiful, too melodramatic. I think it would have been more interesting if we actually got to see his life before he became a freak show attraction. Nevertheless, this film is still a must-see.